This chair is very useful for stretching, preventing spine disorders, rehabilitation, correcting posture, reducing stiffness and improving circulation. Featuring a sturdy base designed with 4 rolling wheels, of which 2 can be locked into position, this is the perfect chair for in the home or at the office. Additionally, this chair acts as a shock absorber while you are seated in it and helps to ease your body into an ergonomic position for improved posture. You will appreciate the fact that you can practice stretching and strengthening key muscles without having to visit a gym. 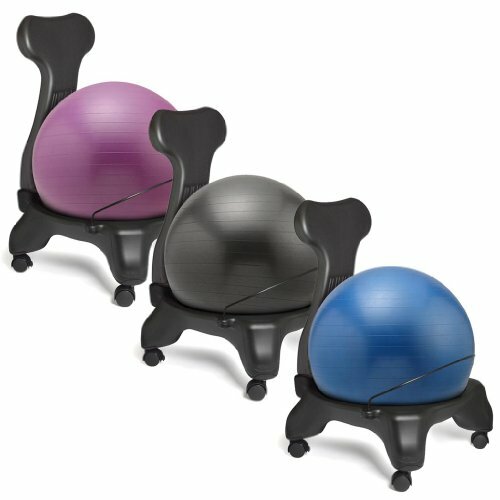 This chair offers numerous other benefits and many more when used with a balance ball. This purchase includes a black balance & stability ball as well as a pump to inflate the ball. Color: Black and comes with Dark Grey or Blue or Purple balance ball and pump. If you have any questions about this product by Sivan, contact us by completing and submitting the form below. If you are looking for a specif part number, please include it with your message.